Physical containment isn't enough. Lab dishes and industrial vats can break; workers can go home with inadvertently contaminated clothes. And some organisms are meant for use in open environments, such as mosquitoes that can't spread malaria. 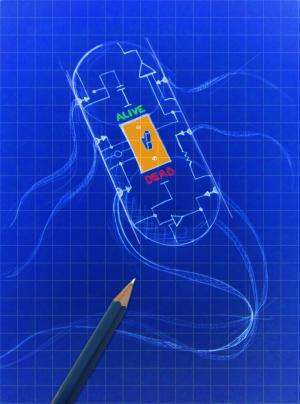 So attention turns to biocontainment: building in biological safeguards to prevent modified organisms from surviving where they're not meant to. To do so, geneticists and synthetic biologists find themselves taking a cue from safety engineers. "If you make a chemical that's potentially explosive, you put stabilizers in it. If you build a car, you put in seat belts and airbags," said George Church, Robert Winthrop Professor of Genetics at Harvard Medical School and core faculty member at the Wyss Institute. And if you've created the world's first genomically recoded organism, a strain of Escherichia coli with a radically changed genome, as Church's group announced in 2013, you make its life dependent on something only you can supply. Church and colleagues report Jan. 21 in Nature that they further modified their 2013 E. coli to incorporate a synthetic amino acid in many places throughout their genomes. Without this amino acid, the bacteria can't perform the vital job of translating their RNA into properly folded proteins. The E. coli can't make this unnatural amino acid themselves or find it anywhere in the wild; they have to eat it in specially cooked-up lab cultures. A separate team reports in Nature that it was able to engineer the same strain of E. coli to become dependent on a synthetic amino acid using different methods. That group was led by a longtime collaborator of Church's, Farren Isaacs of Yale University. In addition, "We now have the first example of genome-scale engineering rather than gene editing or genome copying," said Church. "This is the most radically altered genome to date in terms of genome function. We have not only a new code, but also a new amino acid, and the organism is totally dependent on it." Church's team, led by first authors Dan Mandell and Marc Lajoie, HMS research fellows in genetics, also made the E. coli resistant to two viruses, with plans to expand that list. One method involves turning normally self-sufficient organisms like E. coli into auxotrophs, which can't make certain nutrients they need for growth. Humans are auxotrophs, which is why we need to include vitamins and other "essential" nutrients in our diets. Altering the genetics of E. coli so they can't make a naturally occurring nutrient doesn't always work, said Church, because some of them manage to scavenge the nutrient from their surroundings. He lowered that risk by making the E. coli dependent on a nutrient not found in nature. Church's solution also took care of concerns he had with another biocontainment technique, in which genetic "kill switches" make bacteria vulnerable to a toxin so spills can be quickly neutralized. "All you have to do to kill a kill switch is turn it off," which can be done in any number of ways, Church said. Routing around the dependency on the artificial amino acid is much harder. Church determined that another key to making a successful "synthetic auxotroph" was to ensure that the E. coli's lives depended on the artificial amino acid. Otherwise, escaped E. coli could keep rolling along even if they couldn't make or scavenge it. So his group targeted proteins that drive the essential functions of the cell. "If you put it off on the periphery, like on the paint job of your car, the car will still run," he explained. "You have to embed the dependency smack in the middle of the engine, like the crank shaft, so it now has a particular part you can only get from, say, one manufacturer in Europe." The need to choose a process essential to E. coli survival and a nutrient not found in nature "limited us to a small number of genes," Church said. His team used computational tools to design proteins that might cause the desired "irreversible, inescapable dependency." They took the best candidates, synthesized them and tested them in actual E. coli. They ended up with three successful redesigned essential proteins and two dependent E. coli strains. "Using three proteins together is more powerful than using them separately," Church said. He envisions future E. coli modified to require even more synthetic amino acids to make escape virtually impossible. As it was, the escape rate—the number of E. coli able to survive without being fed the synthetic amino acid—was "so low we couldn't detect it," Church said. The group grew a total of 1 trillion E. coli cells from various experiments, and after two weeks none had escaped. "That's 10,000 times better than the National Institutes of Health's recommendation for escape rate for genetically modified organisms," said Church. The weaknesses in Church's methods remain to be seen. For now, he is satisfied with the results his group has obtained by pushing the limits of available testing. "As part of our dedication to safety engineering in biology, we're trying to get better at creating physically contained test systems to develop something that eventually will be so biologically contained that we won't need physical containment anymore," said Church. In the meantime, he said, "we can use the physical containment to debug it and make sure it actually works." Ha! Perhaps some mad alien scientists, many billions of years ago, inadvertently let loose some synthetic stuff that seeded our galaxy and voila... life as we know it. 1) People want real food created by Nature/Mother Nature/God for our bodies. We miss genuine food that looks, tastes and smells great and keeps our bodies strong. GM seed companies are wholly unqualified and incompetent for the task of designing food. We want to rely upon the infinite intelligence of Nature which creates and maintains the whole cosmos. Nature's intelligence is all-encompassing and human intelligence is always limited and short-sighted. Nature designed our bodies and we trust and rely upon Nature to design our food. 2) We want agriculture that does not damage the ecosystem. We want to respect, protect and preserve the planet for all future time. Remember the #1 rule for a successful company? "Give the consumer what he wants." These are the issues that are dear to the public's hearts.